Now that you have chosen to use a Soda Blaster manufactured by Soda Works you have cleared the biggest hurdle in in claiming your place among the most productive soda blasting companies in the country. But owning a Buster Blaster system is only part of the equation. 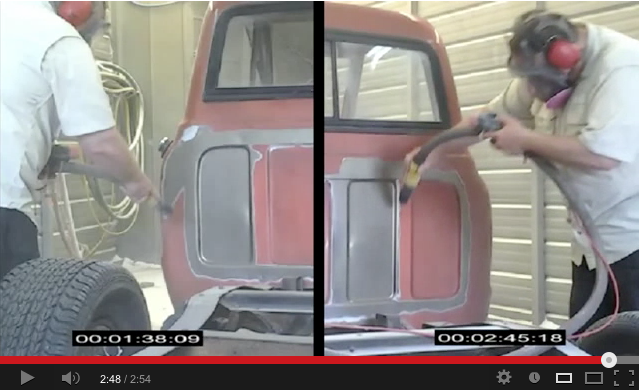 The results you obtain will vary with the type of soda blasting media you choose to use. You might be thinking "Baking soda is baking soda." While this is true, not all baking soda makes good soda blasting media. At Soda Works our goal is the provide you with the best soda blasting systems in the world. To reach this goal we have analyzed every aspect of the soda blasting process. Our system delivers the driest air possible to our patented venturi metering system. We use our proprietary nozzles. We have analyzed and perfected every aspect of our system down to the very baking soda that is being used in the process. Our research has proven to us that not all soda is alike. We recommend and sell only Natrium Soda Blasting Media. We strongly feel that Natrium soda is the only Soda Blasting Media that should be used in soda blasting. Why? 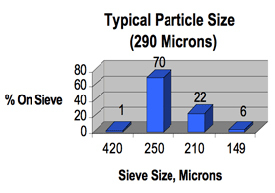 It all has to do with particle size and in soda blasting, size matters.alt The size we are referring to is the size of the sodium bicarbonate crystal that makes up the media. The Natrium 260 Soda Blasting Media is manufactured in a process that results in a consistent crystal size. Over 90% of the Media is will not fit through a U.S.Standard #70 screen. This is a good thing. Larger particles equal less dust and more work. We have found the Natrium 260 to be the ideal size for soda blasting. Smaller crystals than the Natrium 260 don't get as much work done and larger crystals put excessive wear and tear on the equipment without resulting in significant gains of efficiency. Natruim 260 Soda Blasting Media is pure Sodium Bicarbonate. There are no "flow additives" or other adulterants. Other "Soda Blasting" systems cannot deliver air that is dry enough. Even if you hook up one of our Buster Blaster pots to their air supply, the moisture in the air will cause the Soda to clump and clog. Rather than be thorough and design a proper soda blasting system, other manufacturers "blame the soda" and add junk into the soda which diminishes the purity of the process. Sodium bicarbonate is completely water-soluble. You can rinse every trace of it away with a hose. "Flow additives," typically calcium carbonate, are not water soluble. To remove them from your work site requires more time and effort on your part. What's more is the "flow additives" do not do any of the work of blasting, they simply make more dust and more mess for you to clean up afterward. Natrium 260 Soda Blasting Media is the very best soda blasting media available. It is pure sodium bicarbonate so you have no additional environmental hoops to jump through. The manufacturing process gives a consistent, predictable product. With every shipment of Natrium 260 Soda Blasting Media we receive, there is an analysis report on that specific batch. We are happy to furnish this information to anyone. We are also happy to send a free sample of Natrium to anyone. Just call or e-mail us and give us your shipping information, we will get some into the mail to you right away. We can ship any amount from a single 50 lb bag to multiple pallets. When you use Natrium 260 Soda Blasting Media with a Buster Blaster Soda Blasting system you will be among the most productive and profitable soda blasters in the country! CHECK OUT this comparison video between Natrium Products Blast Media and another leading Soda Blast Media manufacturer. The 40% better production directly affects profit margin, production, visibility and clean up.